John Rose stands at the highest level of the foundation that once supported the Contention Mill, which was the mill closest to downtown Contention City. Each level of foundation supported a different aspect of the production. These stamp mills are found on hillsides along the San Pedro River. This made production more efficient as the raw ore was dumped off wagons in the area where Rose stands, and then worked downward through the lower levels as it became more refined. These terraces are all that's left of the once thriving factories that offered many good paying jobs under challenging working conditions. A close up of the fine stone masonry work on the Contention Mill. A few timbers still are visible. The higher terraces are giving way to exposure and melting into each other, returning the site to more of a sloped area. The foundation remains of the Grand Central are all that's left of the most powerful mill in all the Tombstone district. With telephone service to Tombstone in 1881, this advanced mill generated millions of dollars in it's early years of use. It was to this location that John Clum arrived after his ill fated stage coach ride in December 1881, slept for two hours, borrowed a horse, and continued on his "vacation." This claim dated April 26th, 1880, was the beginning of the Grand Central Mill site, the most important stamp mill in all of the Tombstone District. The claim is in the name of E.B. Gage, who makes a minor error when describing the location of the soon to be built Grand Central Mill as "five acres of ground for a Mill Site...on the San Pedro river near and north of the Contention Mill..." The Grand Central Mill was located south of the Contention Mill, not north. Though having a very minor struggle with directions, it was Gage who led the Grand Central and himself to great success during much of the 1880's. This success would later allow Gage to help provide bail money for Wyatt Earp and Doc Holliday, as they were unhappy guests at the chilly Tombstone jail during a portion of the Spicer hearing-this was in the wake of the gunfight near the O.K. Corral, in the winter of 1881. The Grand Central Mill was also visited by one rattled John Clum on the night of December 14th, 1881. Leaving Tombstone on a Stage Coach for Benson, gunfire by highwaymen prompted Clum to head out on foot across the darkness of the desert, as he believed the gunfire was meant for him. "...I realized that my presence in the coach only jeopardized the other passengers. I was much better off with my feet on the ground and no sidelights. [referring the lanterns mounted on the side of stage coaches for night travel] I struck off through the mesquite and cactus on foot. After a precarious trek, in and out of ravines, I arrived at the Grand Central quartz mill about one o'clock a.m. The mill superintendent was a friend and I told him my story. He telephoned to Tombstone that I was safe. [see newspaper clipping entitled Telephones for Tombstone.] 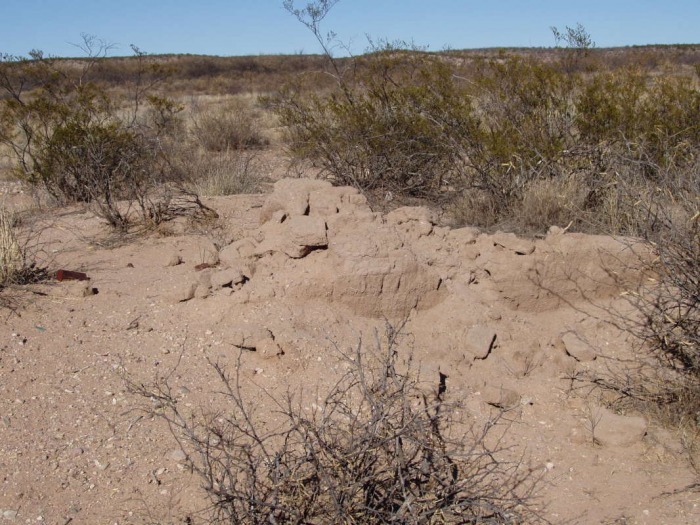 I slept there for two hours, borrowed a horse, and at 3 a.m. was again en route..."
Although John Clum wrote that "I struck off through the mesquite and cactus on foot. After a precarious trek, in and out of ravines, I arrived at the Grand Central," it appears more likely that the final leg of his midnight walk to the Mill was on this Ore Wagon road, which was a separate route from the Tombstone to Benson Stage Road, and is visible in this satellite photo today. Note the straight lines of the Grand Central foundation. As a collector it always amazes what things survive the ages and what does not. This paycheck from my collection is for labor at the Grand Central is from a group of personal papers of E.B. Gage. The check is signed by long term mill worker S.W. Woods, who became Supt of the Mill as this 1888 check shows. Woods also gave a deposition to the Garner vs. Gird case, which is a bonanza of information for Tombstone studies. 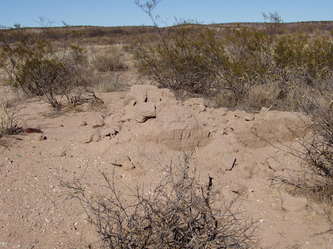 The foundation remains of the Sunset Mill, the smallest of the commercial stamp mills in the Tombstone district in the early 1880's, located at the northern end of Contention City. These timbers are the remains of a bridge that once connected downtown Contention City to the stage road heading north. Just one day before the shooting death of Stage Coach driver Bud Philpot outside of Contention City, this letter from Contention reminds the reader of the day that Contention stands for law and order, even though it quips that "No one has died, but some ought to." 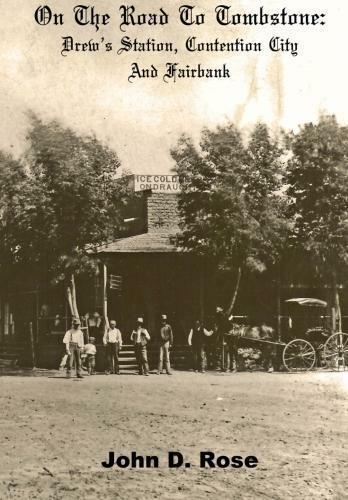 An interesting note regarding a recently closed saloon after a visit was paid by the new Sheriff of the just created Cochise County-this would be Johnny Behan. The economy of Contention was it's silver stamp mills, turning Silver Ore into Silver bars day and night. 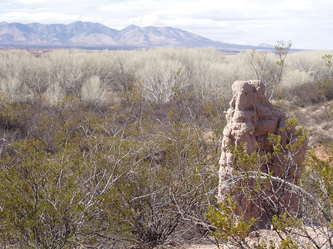 The San Pedro River flows between both sites of Contention City in this photo. In this area of the river there was an island. This was a source of local gambling as some would bet against those who would attempt to jump their horses from the east bank to the island, from the island to the west bank, and then back again. Since the 1880's, the river itself has widened greatly in this area and washed through portions of the west bank Contention site. The east bank Contention site sits higher and therefore is safer from the ravages of the river. It's losses may be man-made. See the other caption information. This is a view of part of downtown Contention city. This is the first townsite, on the east side of the San Pedro. Later Contention would also expand to the west side of the river as well. Arrows mark the ruins in the foreground, and far in the distance they mark the location of the Contention Mill. From this view one can really observe the amount of excavation needed the build a Stamp Mill. To the right of the Millsite shows the side of the hill undisturbed in its natural state. For years I tried to find a reason as to why Charleston still had standing walls and Contention had far less. This was especially odd in light of the oft repeated local story that Charleston was used by the U.S. Army for combat training during World War II. 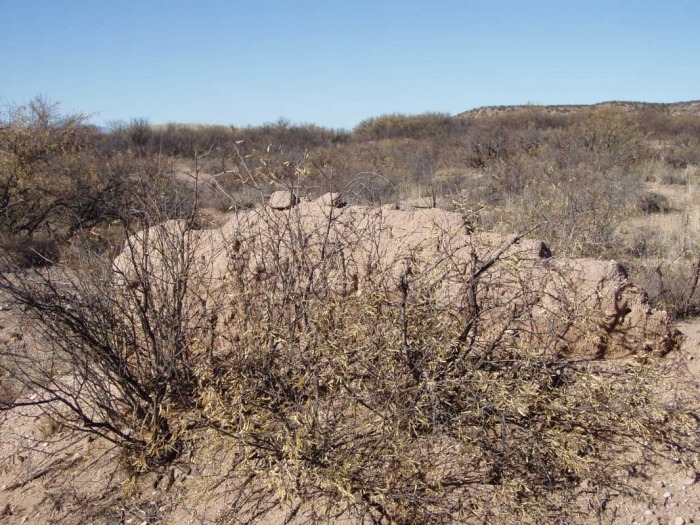 One researcher theorized that conditions at Contention where somehow more harsh, thus the low survival rate of adobe, and this didn't seem likely either. But in the 1995/96 time frame, I was the Historian for a tourist train that ran along the San Pedro from Benson to the Charleston area. During my many rides, I was occasionally approached by elderly men who claimed to have been the Foreman of the Boquiallas Ranch, one of the great ranches of Cochise County which was owned by the Hearst family for many years. After meeting a dozen or so "Foreman", I began to wonder if the ranch was full of management without any cowboys to do the work, or perhaps there was a bit of embellishment in the status of some of these old timers. 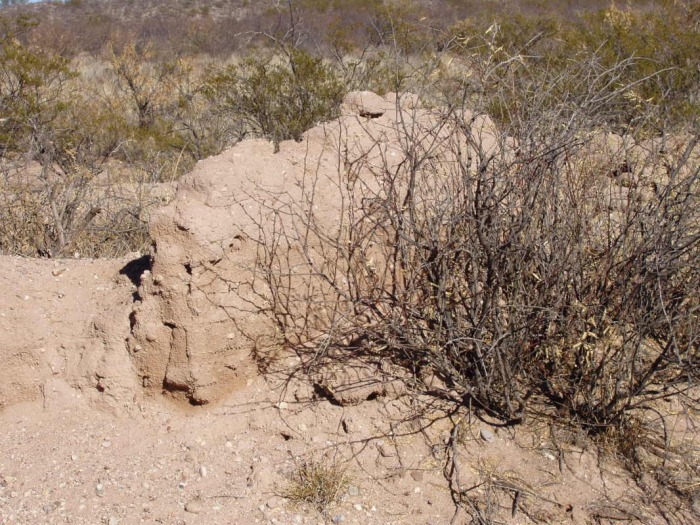 But there was one elderly man I met while on the train who said he was the Foremen of the Boquillas, and in conversation he knew so much specific detail that I found him believable. When I asked him why so few walls remained at Contention, he told me that while Foreman, he had experienced some serious problems with some difficult squatters living at Contention City, and the owners of the ranch ordered the entire site bull dozed. I mentioned that all these years later, there were still a few remaining walls visible. He said that he had decided to leave a few standing, just so that the next generation could at least know where some of it had been, but not enough so that anyone could live in. To date this is the most reasonable explanation I have heard as to what could have happened to the ruins at Contention City. This image shows the remains of the New Mexico and Arizona (N.M&A.) 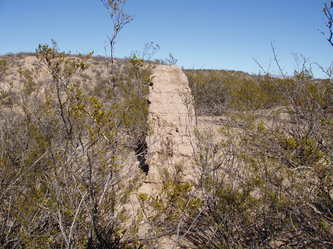 Rail Road bed from the downtown area of Contention City. 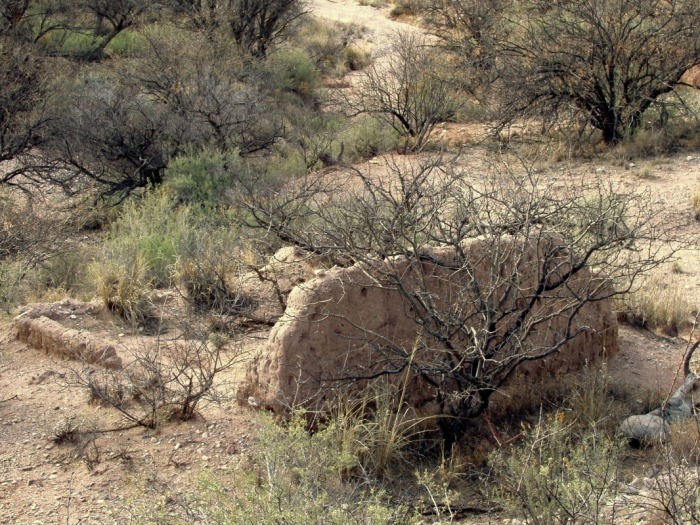 The large pieces would that appear like broken logs standing up are all that remains of a bridge that once supported the trains of the N.M&A, and the built up dirt to the right and left of the wood was a portion of the Rail Road bed. Across this bridge road many a passenger and cargo destined for all parts of the area, with people and goods off loading on and off the RR and continuing on by wagon and horseback to Charleston, Tombstone and other points. By mid March of 1882, this RR had just begun service from Benson to Contention, and on March 19th Wyatt and Warren Earp came to Contention and loaded as cargo the remains of their brother Morgan, who was assassinated the night before in Tombstone. I was struck by the irony of this location the first time I saw it, and went back years later in the mid 1990's to take this and other photos. With a clear view of the bridge area that Morgan Earp's remains crossed over, the view in the far background shows the southern end of the Whetstone Mountain range. Just five days later, filled with grief and anger, it was in this area that Wyatt Earp gunned down Curly Bill Brocius as his Vendetta ride was in full swing, on March 24th, 1882. This is a close up of the New Mexico and Arizona(aka, N.M.&A) stamp. The close up is taken from a larger document for shipping cattle from Nogales to Fairbank in 1885, from the collections of John D. Rose. The construction of the N.M&A began at Benson so that it could join the mainline rail of the Southern Pacific RR. Contention would be the first location of any significance(a population of just under 500 in 1882) in the Tombstone District to have service by RR, but not the last. Fairbank would greet the arrival of the same rail not long after, and other companies would later build through the Charleston area, but only after the town was all but gone in the 1888/89 time frame. The key city of the District Tombstone, would not see service until 1903. As recently as the early 1990's you could still see Oyster shells on the ground, likely served at a Contention City Restaurant. The shipping of the Oysters would have arrived via the N.M.&A. Billy Ohnesorgen and H.C. Walker teamed together to take on J.D. Kinnear in a heated stage coach competition. Walker had previously worked for Kinnear, learning much from him about the stage business that he would soon challenge him in. Ohnesorgen would back away from the challenge, turning over his share of ownership to Walker, who would later be forced to merge with Kinnear as a matter of sheer economic survival. This image of Ohnesorgen and Walker's primitive stage coach office was taken in Contention City by visiting California photographer Carleton Watkins, whose record of Arizona photographs serves as one of the great visual records of the era. The rough look of the building fit in well with what was much of Contention City, which architecturally, was far from a success. Note the Wells Fargo & Co Express sign to the right of the doorway. A bridge on the N.M. & A as it traverses over and along the Babcomari River, a tributary of the San Pedro. A closer view of the same N.M. & A bridge as it crosses the Babacomari river. A close up view of the ornate corner bracing of the same bridge. The very sparse remains of the first Contention City, located on the East bank of the San Pedro River.